Silverstone - I Say Ding Dong Shop - Buy Stickers, Decals & Unique Automobilia. 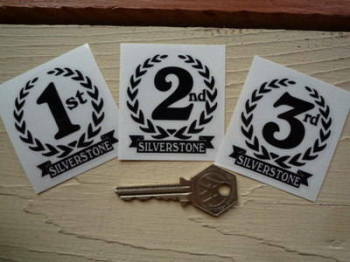 Silverstone 1st, 2nd & 3rd Podium Garland Stickers. 2". Silverstone A43 Road Sign Banner Art. 29" x 15". Silverstone Circuit Gulf Sticker. 3.5". Silverstone Grand Prix Shaped Union Jack Sticker 4" or 5"
Silverstone International Daily Express Trophy Meeting Sticker. 8.5". Silverstone International Trophy 1961 Sticker. 2.75". Silverstone RAC A43 Sticker. 6" or 12". Silverstone RAC British Grand Prix 1965 Sticker. 3.25". Silverstone RAC British Grand Prix 1967 Sticker. 3.25".